Beautiful detail photograph by Embrace Life Photography of the serving tables at this glam birthday event. The prominent purple floral bouquet is made up of lavender flower stems, purple hydrangeas and several shades of roses in a large clear glass vase. The tables are set on mint green pinched pleat linen with stacks of multi-colored and varying designed plates. 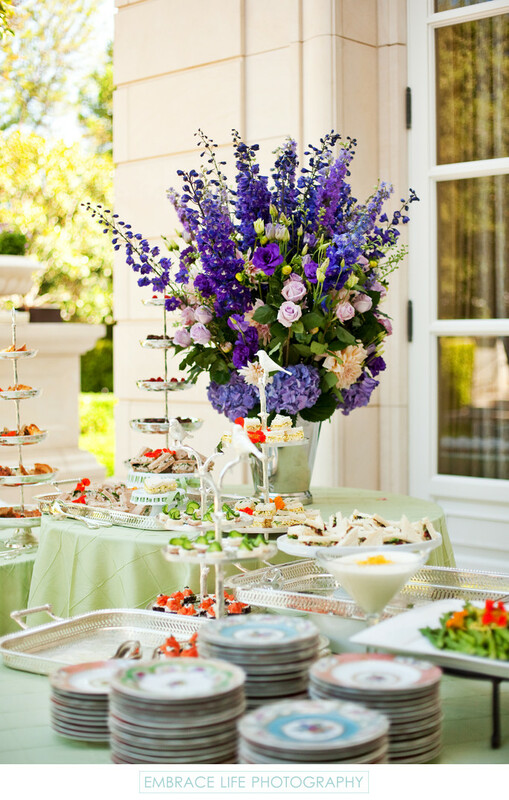 The finger foods are elegantly arranged on various sized white or silver tiered plate holders. Keywords: Details (1125), Event Photography (384), Flowers (471), Food and Drink (150).